By Donald White. Fifteen successful women will be honored with the prestigious 2016 Top Women in Business Awards, one of the oldest and largest events honoring women in Lake Norman, Cabarrus County and University City. This year presented a stellar crop of candidates — 23 in all — including a fitness instructor, the executive director of a battered women’s program, and leaders of the Cabarrus Chamber of Commerce and Habitat for Humanity, among many deserving contenders. This year’s Top Women said they benefitted from strong women mentors in their own personal and professional lives, and they are paying that forward by helping guide younger women. Mentoring was a major theme of the essays nominees sent to Top Women judges this year. Many said they owed their successful careers to accomplished women who had blazed a trail for them and set an example to follow. Nominees are often owners, founders or partners of small, medium and large companies or nonprofits. The judges’ criteria included, in part, leadership skills, progress in achieving business or personal goals, charitable work, length of tenure with an organization, management of important projects or teams, involvement in major programs and events, and ability to juggle challenging workloads with the demands of family. The members of the Top Women Class of 2016 have demonstrated remarkable resilience and perseverance, often overcoming setbacks to realize their goals. Lawrence said this is an admirable quality for women in leadership roles. Top Women nominees stand out for their determination not to let a setback stand in the way of their goals. Many of them said that challenging times in their lives made them all the more determined to forge ahead to realize their dreams—and taught them things they didn’t know about themselves. 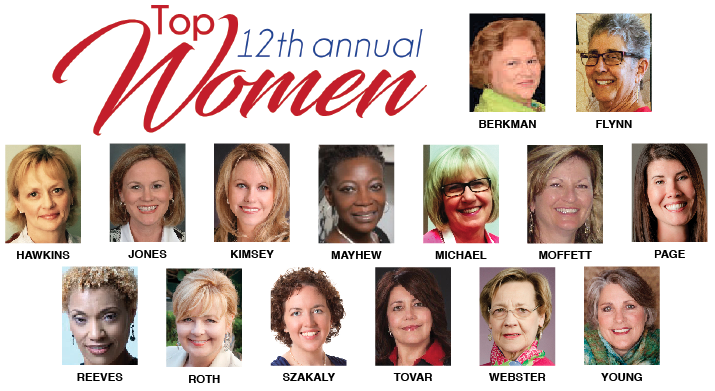 Business Today created the Top Women Awards 12 years ago to honor the Golden Crescent’s most dynamic women in business, nonprofits, community service, education and politics. All judges are former Top Women winners. This year’s judges are Angela Swett, marketing director for Davidson-based McIntosh Law Firm; Cabarrus County Commissioner Diane Honeycutt, one of the top Allen Tate Realtors in North Carolina; Cornelius business attorney Catherine Bentz; former Lake Norman Chamber Chairwoman Wendy Moran; event planner Karen Lawrence; community leader Susan Tillis; Georgia Krueger, director of the Ada Jenkins Center in Davidson; and Tammy Whaley, senior manager of economic development for Duke Energy in North Carolina. Prior Top Women winners include Cyndie Mynatt, owner of the Concord-based Ben Mynatt auto dealerships, Abigail Jennings, president of Lake Norman Realty, based in Cornelius; Kate Gaither, owner of Mooresville-based Newport Properties; Dianne Snyder, chancellor of Cabarrus College of Health Sciences; Robin Salzman, co-owner of Lake Norman Chrysler Dodge Jeep; and Phyllis Wingate, CEO of Carolinas Medical Center-Concord. A Champagne Reception to honor this year’s winners will be held from 6-9 p.m. Thursday Oct. 27 at the River Run Country Club in Davidson.